Welcome to Myatlanticare! 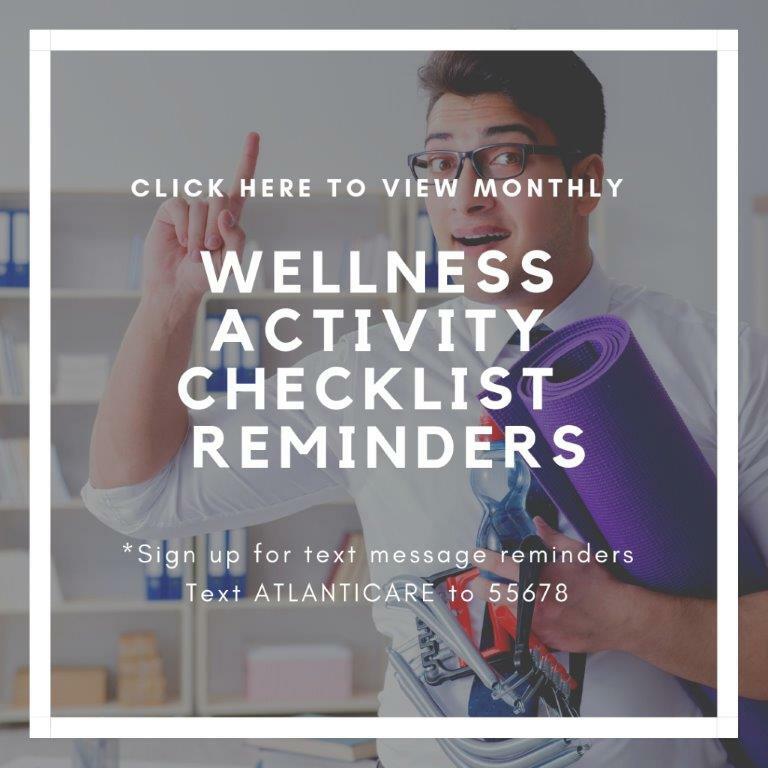 Here you can find wellness information, view and schedule upcoming classes and events, and review your personal wellness tracker designed to keep track of your wellness activities. The Member Portal is Horizon Blue Cross Blue Shield of New Jersey's enchanced online service feature that gives you expanded access to information about your health care benefits, claim status and much more. It saves you time by allowing immediate access to important information about your Horizon BCBSNJ health plan. Click here to learn more on how to use the Horizon Member Portal. To access the Horizon Member Portal visit www.horizonblue.com. This is the contact information for all of the PCP's who are a part of Primary Care Plus. This is FAQ's about Primary Care Plus and what it means. beginning April 1st - April 29th. Interested participants MUST sign up by April 7, 2019 in order to participate. Earn $100 in Wellness credits towards the Make it Personal section of the 2019 Wellness Activity Checklist for successful completion of challenge! Learn how to get the right care at the right time when considering primary care, urgent care, e-visits, or emergency room care. This updated weight management program offers a team based approach to help you lose weight, address barriers to weight loss and educate you on the health benefits of losing weight beyond the number on the scale! Join other AtlantiCare employees in friendly competition by tracking your physical activity with a Fitbit device. Participants will be entered into random drawings for prizes throughout the duration of the program. Omada is a digital health program that includes a wireless scale and other resources linked to your online account to help build healthy habits. Participants are paired with a personal health coach and online peer group for daily feedback and support. The Omada program is open to most Engaged Plan members with a BMI greater than or equal to 30. Click here to view a list of Weight Management Resources. For more information please call 609-677-7507. Choose whether this goal will be a one-time event or if it will occur more than once (i.e., recurring). All goals should have an end date so you can track and complete them. Possible barriers is a place for you to write down the things that may get in the way of you accomplishing your goal. For example, if you plan to walk during lunch, a work meeting may prevent you from meeting your goal. Strategy to overcome barriers is where you identify what you’ll do when you experience a barrier to accomplishing your goal. For example, if a work meeting is scheduled during the time you plan to walk, your strategy may be to block out another time on your calendar during the day to have your walk.